AT&T is usually first to the party with new phone releases, or at least with their announcements for availability. Not so with the LG G4 - though the phone's launch on various carriers is only separated by a week or so, Ma Bell decided to wait until just a day before to let us know. 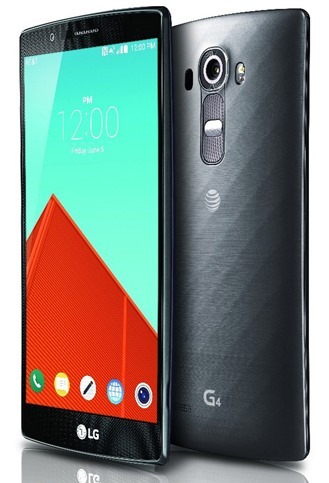 In any case, you'll be able to buy LG's latest flagship on AT&T starting tomorrow on its website (at 12:01 AM Eastern, according to the blog post) and on Friday, June 5th in stores. The G4 will be pricier on AT&T than on T-Mobile. The standard model with the grey plastic back will cost $199.99 on contract, $629.99 without one, or split up into payments on the carrier's various Next plans. The swanky leather version (available only in black on AT&T - T-Mo has an exclusive on the brown model, for some reason) will run you $239.99 or $669.99, respectively. The LG G4 uses a more conventional design that recent flagships from Samsung and HTC, and some users are happy for it, since it also comes with a removable battery and MicroSD card slot. The phone's 5.5" 2560x1440 screen is impressive, as are the 16MP F/1.8 rear camera (with manual mode), Snapdragon 808 chipset, 3GB of RAM, 32GB of storage space, 3000mAh battery, and Android 5.1 software build. You can read David Ruddock's full review here.